The mere mention in the same sentence of the words "Fed" and "bond purchases" gave rise to a fresh, albeit somewhat hesitant spree of risk asset purchases that was manifest on Thursday. Some newsletter scribes were quick to declare that "QE3" by any other name was upon us, and that the resultant hyperinflation would certainly send certain assets (but gold and silver mostly) into deep-space. Of course, as is often the case, had the aforementioned pundits bothered to actually read the news releases on the subject at hand, they might have come to a slightly… different conclusion, based on comments such as the one by Richard Gilhooly, the U.S. director of interest-rate strategy at TD Securities. Mr. Gilhooly, in an e-mail note to TD clients, said that "the new sterilized QE would allow the Fed to buy more assets with an eye toward keeping inflation expectations low. 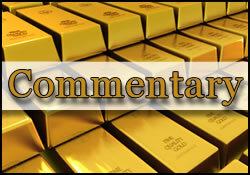 This would be dollar supportive and would be negative for risk assets such as gold." This take is based on the fact that, this time around, the Fed is considering offering additional bond purchases (if conditions require them at all) in a "sanitized for your protection" kind of way — one that does not play directly into the hands of the Tea Party alarmists who keep warning that the Obama Fed is about to lose control and drag Americans into a new iteration of the Weimar Republic (or Zimbabwe circa 2009). In this morning’s US employment report it was noted that the U.S. economy added 227,000 jobs in February. This was a very solid metric and it was certainly above economists’ expectations. While the figure was not good enough to make a palpable dent in the nation’s overall unemployment rate (the unemployment rate remained at 8.3%, largely because more people entered the workforce in search of jobs) , it certainly was sufficiently positive to send stock futures sharply higher and gold prices notably lower at the same time. Whereas gold had opened in New York right around the pivotal $1,700 mark, the Labor Department data sent the yellow metal some $20-25 lower, and to a low of $1,675 per ounce, within the first hour after the figures were released at 8:30 AM. Gold’s three-and-a-half year bullish line is currently crossing near the $1,591 area and its 200 DMA is at $1,672 (nearly the figure touched this morning again). Hopefully, would-be Indian buyers might find price tags sufficiently attractive at their local bazaar over the weekend and make some sorties. The market needs physical buyers quite badly, and they have not reported to ‘duty’ at levels above $1,700 a whole lot. Monetary policy expectations and inflation expectations (or the lack thereof) have become the principal drivers of the price of gold in recent weeks. The general idea is that if the US economy continues to show such signs of improvement, the Fed would be less and less inclined to offer anything that smacks of a QE3 or even the aforementioned "OT2" (Operation Twist 2). That is not gold-positive, as we learned on the 29th of February and once again on the 7th of this month. Silver dropped more than 60 cents to a low of $33.04 per ounce in the wake of the US jobs report while platinum and palladium headed lower as well. The former was quoted at $1,647 per ounce (down $14) and the latter fell to $685 (also by $14 per ounce). Rhodium was quoted unchanged at $1,475 the ounce. As could have been suspected, the US dollar climbed robustly after the data, showing a gain of 0.71 to 79.88 on the trade-weighted index. The pivotal 80 level on that index is now in play. Doomsayers, beware. The euro did not enjoy to pop one might have expected in the wake of Greece successfully restructuring its debt and (for the time being) avoiding a messy default; it remained just above $1.31 against the greenback. The Greek bond swap deal notwithstanding, the basic problem in Europe remains unresolved. As the twin issues of growth and austerity are mutually exclusive, Europe will need to find the answer to the former, first. Crude oil slipped 44 cents to the $106.14 per barrel mark. The Dow Jones Industrial Average was ahead by about 30 points shortly after the opening bell in New York this morning. We have already noted here that job gains for January were revised up to 284,000 from 243,000 — the biggest monthly increase since the recession ended — and December’s employment gains were revised up to 223,000 from 203,000. The past three months of full-time job growth the USA were the fastest since early 2006. The string of six straight months of job additions actually has no peer until we look back into the Reagan era, circa 1983-1984. It was reported yesterday that US consumer confidence climbed to a four-year high, and that US household net worth rose by 2.1% to 58.5 trillion in the final quarter of 2011. All of the above, when taken into consideration, brings us back to a discussion on the so-called Taylor Rule. The market analysis team over at Standard Bank (SA) — while still bullish on gold’s prospects for a fresh high above $1,900 (circa Q3) and while still anticipating gold to test $1,650 in coming sessions — has offered the opinion (borne out by the rule’s construct) that "for the first time since Feb 09, [it] now signals that the Fund funds rate may be too low. "The Taylor Rule provides an indication of where the Fed funds rate should be, given US unemployment and inflation. Until December last year, the Taylor Rule signaled that the Fed funds rate should actually have been negative. However, given that nominal interest rates can’t be negative, the Fed embarked on QE. However, according to the Taylor Rule, the incentive for further QE has disappeared — for now." The Fed meets next week and market observers do not anticipate anything more than a "stay the course" type of statement to come in the aftermath of the gathering. Further easing is also further from the ECB’s mind than it has been in some time. In fact, recently installed ECB President Mario Draghi has already concluded that his institution has done as much as was willing to do in order to combat the regional debt debacle and that the time to pave the road towards exiting from its pro-liquidity stance may be upon us, and soon. Mr. Draghi is, as is the Bernanke-led Fed, cognizant of the risk entailed in getting away from accommodation too late. Bloomberg News reported that "declaring that the environment "has improved enormously "and there are "many signs of returning confidence in the euro," Mr. Draghi turned the spotlight instead on "upside risks"to inflation, which is now forecast to remain above the ECB’s 2 percent limit this year. That suggests policy makers don’t plan to cut rates further or add to their 1 trillion euros ($1.32 trillion) of long-term loans to banks, economists said." Well, while the Fed stands pat and/or mulls and inflation-cleansed OT2, and the ECB tilts towards an eventual tightening, the situation for China’s PBOC appears to shift into a different and perhaps opposite direction. Blame the country’s economy, which, as shown in the latest metrics, has slowed more than expected and might do more of the same in coming months. One of the corroborating statistics for the above-mentioned disconcerting trend (for commodity buffs especially) is the latest reading on Chinese inflation. The rate of growth in Chinese consumer prices came in at only 3.2% last month; that was a twenty-month low. That would also be the slowest gain in inflation rates since June of 2010. It was but last July that the rate of inflation in that country was a (too) hot-to-trot 6.5%. While the Chinese economy is not exactly collapsing, the slowdown has reached a pace that is sufficient for some to conclude that some type of easing might be on offer by the country’s central bank, and perhaps soon. Today we will get data on Chinese consumer spending and factory output, as well as fixed investment (expected to be below historical averages). While on the subject of China, it appears that certain "wishful thinking" being expressed in certain publications about what Chinese gold investors are or are not doing, amount to little more than non-fact-based speculation, or worse (agenda-padding). For example, the shopworn and debatable theory that Chinese (and Indian) investors have not been selling positions into the recent slide in gold prices has been drummed up heavily out there, right along with ill-informed allegations of sinister conspiracy, with the clear intent of bolstering the fast-crumbling morale among Western (mainly US) investors. Developer of the quite-well-performing ZYX Change Method, Nigam Arora, begs to… differ. He does so by having pulled the hard data from the Shanghai Gold Exchange’s volume and price tables for the period from 2/28 to 3/06. As they say, a picture (in this case a table) is worth a thousand words (or, in this case, a million or two gold kilos). No speculating, just the facts, Ma’am. There’s the "Bernanke Effect" in play, a world away, with the same "emotions" on display as we saw in New York just hours prior to this. In The Lead – Deflation! Inflation! How About Neither? Jon Nadler has made me rich. No matter how negative, or doom & gloomy he can get by inserting his leftist views on a subject, I merely do the exact opposite, & I make money, lots of money. Keep it up Jon-Jon!